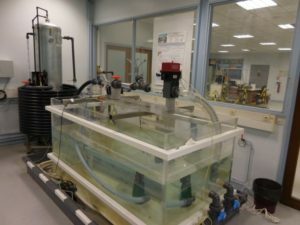 MOTRHYS has developed its own test facility in order to better support its R&D efforts in collaboration with Grenoble Universities. This test facility has the advantage of reproducing rare hydraulic faulty behaviors that affect hydropower plant operation. The range of reproduced phenomena includes (but is not limited to) the following list: fast or slow pressure transients due to flow closure, pressure surges in downstream valves during pipe pressurization, pressure surging from water column separation with cavities collapses, hydro acoustic resonance due to leakage valve instability, as well as other unstable flow/pressure conditions. – The development of proprietary MOTRHYS database describing severe fault scenarios (penstock rupture, significant hydraulic machinery damage, accidents). Since data from a real scale fault occurring on a real installation is confidential to 3rd parties, this is an important asset for the development of the HYDROSURGE software. – Interact with customers in order to highlight the features of the HYDROSURGE software as a reliable and innovative tool for the detection and suppression of dangerous and poorly understood hydraulic faults.